StateWays | www.stateways.com | January/February 2017 27 ent occasions, selecting what they drink based on who they're with and their mood," she says. Pernod-Ricard, with Wiser's, Lot No. 40 and Pike Creek, has both mass market and more niche Canadian brands, and their presence in the market helps broaden the entire international whisky category as well, with different levels of rye and fi nishes. 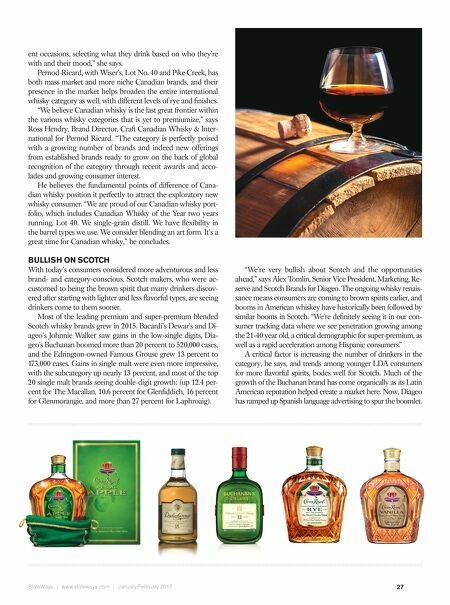 "We believe Canadian whisky is the last great frontier within the various whisky categories that is yet to premiumize," says Ross Hendry, Brand Director, Craft Canadian Whisky & Inter- national for Pernod Ricard. "The category is perfectly poised with a growing number of brands and indeed new offerings from established brands ready to grow on the back of global recognition of the category through recent awards and acco- lades and growing consumer interest. He believes the fundamental points of difference of Cana- dian whisky position it perfectly to attract the exploratory new whisky consumer. 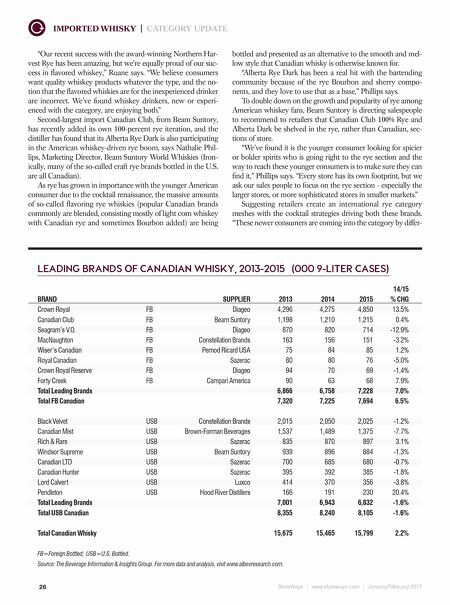 "We are proud of our Canadian whisky port- folio, which includes Canadian Whisky of the Year two years running, Lot 40. We single-grain distill. We have fl exibility in the barrel types we use. We consider blending an art form. It's a great time for Canadian whisky," he concludes. BULLISH ON SCOTCH With today's consumers considered more adventurous and less brand- and category-conscious, Scotch makers, who were ac- customed to being the brown spirit that many drinkers discov- ered after starting with lighter and less fl avorful types, are seeing drinkers come to them sooner. Most of the leading premium and super-premium blended Scotch whisky brands grew in 2015. Bacardi's Dewar's and Di- ageo's Johnnie Walker saw gains in the low-single digits, Dia- geo's Buchanan boomed more than 20 percent to 520,000 cases, and the Edrington-owned Famous Grouse grew 13 percent to 173,000 cases. Gains in single malt were even more impressive, with the subcategory up nearly 13 percent, and most of the top 20 single malt brands seeing double-digit growth; (up 12.4 per- cent for The Macallan, 10.6 percent for Glenfi ddich, 16 percent for Glenmorangie, and more than 27 percent for Laphroaig). "We're very bullish about Scotch and the opportunities ahead," says Alex Tomlin, Senior Vice President, Marketing, Re- serve and Scotch Brands for Diageo. The ongoing whisky renais- sance means consumers are coming to brown spirits earlier, and booms in American whiskey have historically been followed by similar booms in Scotch. "We're defi nitely seeing it in our con- sumer tracking data where we see penetration growing among the 21-40 year old, a critical demographic for super-premium, as well as a rapid acceleration among Hispanic consumers." A critical factor is increasing the number of drinkers in the category, he says, and trends among younger LDA consumers for more fl avorful spirits, bodes well for Scotch. Much of the growth of the Buchanan brand has come organically as its Latin American reputation helped create a market here. Now, Diageo has ramped up Spanish language advertising to spur the boomlet.